Joe Kernen: President Trump just tweeting: “our economy is doing better than ever. Money is pouring into our cherished dollar like rarely before, companies’ earnings are higher than ever, inflation is low and business optimism is higher than it has ever been. 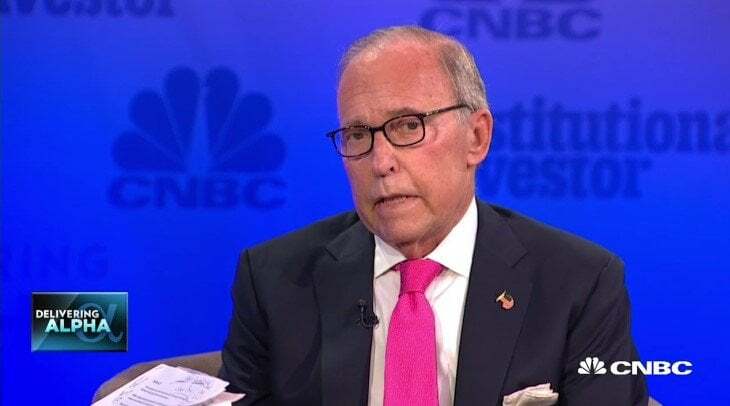 For the first time in many decades, we are protecting our workers.” alright, time for the squawk news maker of the day, let’s bring in national economic counsel director Larry Kudlow. You could have dictate that had maybe to the president but I wouldn’t advise you do that, Larry. But he’s not entirely wrong in your view I would think about some of the stuff he just said. NEC's Larry Kudlow: we keep in close touch, POTUS and I, and I’m honored to do it. And I want to say, Joe, right off the top in lieu of the president’s tweet, I know there’s a lot of weird stuff going on in the media, just like always. But look, my take real fast: the single most important political story of the year is the economic boom that virtually no one thought possible and, Joe, that boom is far from over. That’s the key message I’m trying to relay to you and the gang this morning. And by the by, atlanta fed looking at another 4% quarter in q3, after tax income, you know, take home pay is booming at over 3%. That’s a political indicator. Any way, policies have changed under president trump. We now have tremendous confidence, businesses and consumers and small businesses, lower taxes, regulatory rollback, et terrace, et cetera. Yes, trade reform to protect workers. I think that’s an important part. All’s I’m saying is there’s a lot of whacko stuff out there. I get that. It’s way outside my lane. But the political story of this year is an economic boom that virtually no one thought possible. Kernen: tell us about what you know, Larry, about -- what we’re hearing David Malpass asked china to reenter these trade talks, but we weren’t going to do that unless they at least gave us some signals that they were willing to take some concrete steps. Did they signal that and can you let us know what those steps were? Who’s coming? Who’s going to meet with them? Who’s spearheading our talks right now and when’s it going to be? Kudlow: it’s funny, I talked to Rreasury Secretary Mnuchin this morning about that. My great pal, your great friend, David Malpass under secretary is going to lead the talks for the united states. I can’t say anything specifically about it, Joe. I’m not sure there’s anything specific to say, but -- but -- but, we haven’t had a sit-down with the Chinese either at the top level or the intermediate level in quite some time. I was there in Beijing and then Washington. It’s been a long time. So without getting into any details, I just think this is a good thing. Better to talk than not talk. Kernen: Larry, have you seen -- and you can’t miss it. There is a lot of rumblings that president xi is really -- they’d like to censor it all but there’s so much, it is bubbling out. That he is coming under some criticism which is unheard of, to some extent, for him and from the communist party over there in terms of the way it is being handled. Now is that good? Does that embolden us to ask for too much? Or is that the beginning of some -- a crack we can get through to have a favorable outcome here? Kudlow: well, look. I’m not a china hand, I’m not a china expert, Joe. I can’t really comment on president xi’s political situation. Way out of my lane. I’ll just say this: I think, again, it is a good thing if they’re sending a delegation here. We haven’t had that in quite some time. Second point I’d make is the Chinese government in its totality must not underestimate president trump’s toughness and willingness to continue this battle, to eliminate tariffs and non-tariff barriers and quotas, to stop the theft of intellectual property and to stop the forced transfer of technology. Those are the asks that we’ve been making now for quite some time. Do not underestimate the determination of president trump. Other American presidents have started, and then they give up. President trump’s not going to do that. So that’s my only response with respect to the Chinese situation. Their economy and currency are slipping, as you all know. But let’s just see what happens. You know, sometimes talks can produce better outcomes than expected. Let’s see what happens. Becky quick: Larry, just to push on that -- I know you can’t give away too many details or tell us what’s behind the scenes because this is an active negotiation. But what we had heard before, I think what you’ve told us, is that the Chinese would really have to put an offer on the table, one that would get talks started again. The ball was kind of in their court. Are we to assume that if these talks are on that that’s been the case? Or has been there any negotiation about the negotiation? Kudlow: well, look. I -- yeah. Let’s see what happens when they get here. And then we’ll get a full report obviously from mr. Malpass and others. Again, any time you talk it is better than not talking. We have made – you know, the last few months I barely got down here and we wind up on a plane to Beijing negotiating with the top of their government. Unfortunately we just didn’t get the movement we wanted. That doesn’t mean we won’t ever. It just means they know what we want. As I said -- no forced technology transfers, no IP theft, bring down – let’s eliminate tariff and non-tariff barriers and so forth. Those are president trump’s key points to help American workers and economy. I think it will help Chinese. You know, if they -- Becky, if they open up their markets, let’s just focus on the trade and tariffs for a minute. If they open their markets, whether you’re talking agriculture or industry or financial services or technology. USA will walk through and increase export sales to china by phenomenal rates. We’re the most competitive economy in the world. Because of this unexpected economic boom as a result of new policy. Give us a chance. America is crushing it right now. The world is investing in the USA. Judging by the weakness in the Chinese currency the world’s not investing in china. My point is a simple one. Give us market openings. Take down your barriers. Stop trying to capture and steal technology from the u.S. And western countries. Give us a chance to compete. We will sell a ton of exports to china. That’s the key point. They know what our asks are. Perhaps, let’s be optimistic, they’ll fall through and some good will come. Andrew Ross Sorkin: hey Larry, there was a report earlier this month google was building a new web search engine to be introduced in china that would include censorship. What do you think of that? Kudlow: you know, I’m not an expert there. Is that Andrew? I think it’s Andrew. I can’t see ya. Kudlow: I’m going to stay off that, Andrew. Because I don’t know near enough about it. I’m just let that one go until we get some more information. Kernen: you still mr. King dollar? And I’m just wondering, is it strong enough for you here given that we like to continue increase exports? Is it strong enough here for the president? Kudlow: strong and steady. Strong and steady. Kernen: it’s stronger, rates go up, Larry. Is there a point where you wish it wasn’t quite as strong and the president wishes it wasn’t quite as strong. Kudlow: no. Look, actually, the dollar’s been in a range for quite some time. The DXY, I think around 95, 96. The high was 105. The low was 70 many years ago. As the president noted today, I think that the king dollar, the strong dollar, it’s a steady dollar, is a sign of confidence. OK? There’s a lot of unrest around the world. Money’s flowing into the USA. That’s terrific. By the way, a strong dollar holds down commodity prices, gasoline prices are slipping, oil prices are slipping. I just want it steady. I’m not here to pile up the dollar. The treasury department is in charge of all currency movements. I’m just looking at it in macro economic terms. It is sending a positive story of global confidence in the USA. That’s all. Trillions of dollars are coming in here because we are in an economic boom that virtually nobody thought possible. Kernen: you know, Larry, revenues are up. Tax revenues. But the deficit’s up on higher spending. As a long-time republican and fiscal conservative, are we spending too much and is that going to be something that the administration tries to tackle in some way? I mean we did the defense bill. That was a lot of money. But obviously there’s -- that’s not the only reason spending’s up so much. Are you worried about it? Kudlow: I think yes, yes, and yes, to all your questions. We do spend too much. I would suggest to you in the next budget round president trump is going to be a lot tougher than he might have been in the past. I don’t think he’s going to sign on to these gigantic omnibus spending bills. Nobody knows what’s inside them. They’re too big to begin with. The process is broken up there hopefully that can be fixed. But on the deficit question generically, Joe, first year of a big tax cut you’re going to lose some revenues, quote, unquote. You don’t really lose it. But yes, revenue numbers go down, deficits go up. I don’t deny that. Never have. If you look, though, at re-estimates coming out of Washington -- even the CBO which doesn’t like tax cuts -- we’re picking up $6 trillion in nominal GDP and an average tax rate, that gets you $1 trillion of additional revenues over ten years. We already look like we paid for the corporate tax and we’ve paid for about -- I don’t know -- two-thirds or three-quarters of the overall $1.5 trillion tax cut. So my guess is – many disagree -- but I would argue, deficits are going to come down quite a bit in the next few years as a shared GDP particularly, deficits in terms of the economy is going to come way down. Take a look at the OMB estimates. They’re pretty good. So growth, as well as more modest government will solve the deficit problem. Sorkin: hey, Larry, question on a topic in the headlines, but maybe not directly something you may be thinking about right this second. The NEC is an observer and sometimes participates in CFIUS reviews. The big talk, talking about money coming from foreign lands to ours is whether the Saudis are going to make a massive investment to help take private Tesla. And the question is whether CFIUS should allow something like that. How would you think about it? Kudlow: well, look. I certainly won’t comment on the specific item you just mentioned, andrew. But, it is quite true that working with congress, republican congress, we have bolstered and strengthened all of our foreign investment activities. CFIUS -- I call it CFIUS-plus. It is not directed at any country. It is a global issue. But we do, and we will, protect what I call American family jewels, miles an hour crown jewels. We must do that in the technology space particularly, but also elsewhere. You know there’s cyber hacking and this and that nowadays. So no I can’t comment on that potential transaction, but yes, the CFIUS reform bill is about to become law. We worked very closely with Senator Cornyn and others on the hill, and I fully support that. I think we’ve just got to protect the u.S. Story because that is our future, particularly in the technology zone. Kernen: but they -- Larry, with one minute left, until we have to turn it over to your old – to your current buddy, but your old partner, Cramer. Is NAFTA -- to do a deal, even if it was bilateral or something with Mexico, the time’s running out with the Mexican President. Could we hear something near term next couple of weeks on this? Are we getting that close? Can you say anything? Kudlow: yes. Yes. And our trade meeting with president -- I don’t want to give away any detailed secrets but Trade Ambassador Lighthizer, great friend of mine going back to the Reagan days, yeah, he’s getting close. I think he was a little more optimistic than I’ve seen him in many, many moons. So, yeah, positive on that. Kernen: I’m gonna end. It just quickly. Can confirm that America is a shining city on a hill? I just whether you can confirm that for me? Because I’ve always accepted that as fact but now, you know, some people are doubting that. It is, right? Kudlow: America is a shining city on the hill. This is the greatest democracy and free market economy in the history of history, Joe. Kernen: alright, Larry. The hairs on my neck are standing up now. Kudlow: it is only getting better. Believe me, it is only getting better. Kernen: I’ve got a Chris Matthews thrill from that. Right up my leg. Thanks, Larry.